In a medium bowl, add in the hoisin, ginger, garlic, red pepper, oil, soy sauce and vinegar. Stir or whisk well and poor into a large ziploc bag. Add in the chicken, mushing around to be sure they’re well coated, and refrigerate for at least 6 hours or overnight. Remove 20 minutes before cooking to take the chill off and set aside. Meanwhile, preheat the oven to 375 (350 if your oven runs hot.) Spray a large glass or Pyrex baking dish with nonstick spray. Add the chicken and marinade to the dish, making sure the chicken is spaced evenly apart with its own room to cook. Cover with foil and cook for 25 minutes. Remove from the oven and add in the broccoli florets, scattering evenly around and in between the chicken. Repeat with the shitakes. In a small bowl, quickly mix the stock, soy sauce, and hoisin together until well blended. 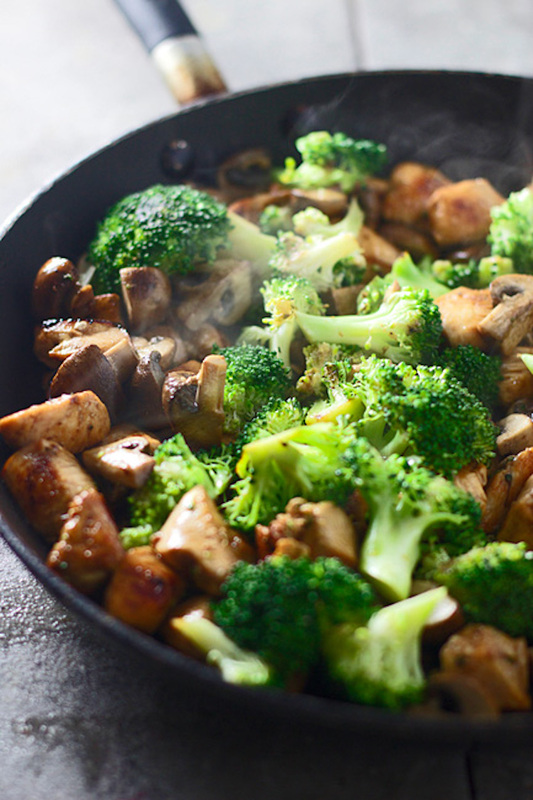 Pour over the veggies around the pan and return it to the oven (without the foil) to cook for another 20 minutes. Remove once again and scatter the bell pepper around the pan. Sprinkle the top of the chicken evenly with the sesame seeds and bake another 5-10 minutes. If the skin hasn’t browned nicely yet (because of the early foil cover which was necessary to keep the sauce from burning) put your oven on broil and cook another 2 minutes until the skin begins to sizzle and crisp up and darken.